This service highlight was originally posted by the California Farm to School Network and was written by FoodCorps Service Member Emily Metzger, who is currently serving with University of California Cooperative Extension, Central Sierra and Gardens to Grow In in Calaveras, CA. As one of the very few California natives in the FoodCorps California program, Emily is strengthening farm to school programs in her home county. When working on local procurement in schools, it seems like the small steps can mean the most. This week in Calaveras County Unified School District, we procured and served our first ever, locally grown Harvest of the Month. After months of planning and years of talking we finally found ourselves doing. This week, 1,700 elementary school students tasted Crimson Giant radishes grown in a field not far from their school. As a FoodCorps service member, one of my goals is to find ways to incorporate local and healthy food into schools. This is more challenging than it may seem, especially in small school districts with limited budgets and very few producers nearby. Harvest of the Month was the perfect first “in” to get fresh, local food into the mouths of our students. In our county, Harvest of the Month is implemented by Valerie Vasile, a Nutrition Educator working out of the U.C. Cooperative Extension. 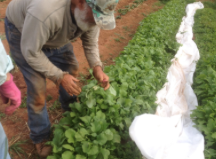 In collaboration with Valerie and Metzger Farms, we were able to strike up a forward contract for 850 radishes. Noah Crosson, my Foodcorps predecessor, now works on my in-laws’ small farm in Calaveras County as a farm manager and is still committed to the goals of FoodCorps. 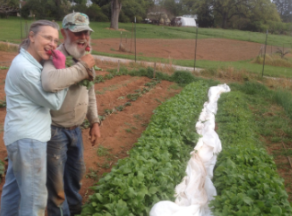 My father-in-law, Farmer Metz, also cares deeply about sharing his love of farming and fresh food with his community. This creates a beautiful partnership of people growing food who also care about the school food environment. Thanks to the support of these farmers along with the support I receive as a FoodCorps service member, a partner of the U.C.C.E., the school garden representative on the Master Gardener board, and as a volunteer for the non-profit Gardens to Grow In, I am in the perfect position to help all stakeholders collaborate, so we can reach our common goal of a healthier community. Implementing our first locally grown Harvest of the Month was quite a whirlwind. Usually our tastings come pre-washed, prepped and ready to go. For this Harvest, I was in the field helping Noah harvest the last of the radishes just hours before hauling 21 boxes of them to Toyon Middle School to begin prep. My weekly middle school cooking class helped me wash, chop and count 850 radishes. Three hours later, the kitchen looked like a mudslide had come through, but we felt we had accomplished a historic feat. Let’s just say I learned a few lessons from this initial experience. Despite the mess and the exhaustion, we successfully sent out bags of radishes to every class in every elementary school in the district along with a farmer profile and story of how those radishes came to be. Teachers reported that they were shocked at how many of their students said they would eat radishes again if given the opportunity. We have proven that when we all work together it is possible to get local food into our schools. We move forward together and are hopeful that this is just the beginning.